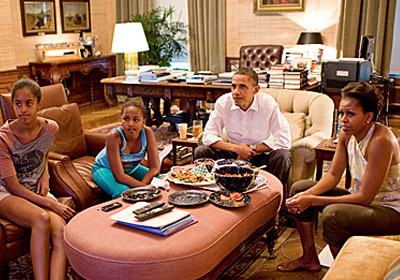 I’m sure the Obamas are not the first First Family to go barefoot in the White House. [Michelle may be wearing flip flops, but Dave sees toes and over he goes. – ed] Or to scatter plastic cups on the furniture and rugs. [For $100,000,000,000 and the Koch Brothers’ heads on a platter: Find the plastic cup[s] scattered on the rug. -ed] Or to eat junk food from the plastic platters. [He knows it’s junk food because … Well, that’s what First Families who treat the White House like it’s their house or something eat! -ed] On the White House ottomans. [Oh dear Lord, no! Not on the sacred White House OTTOMANS. Can Armageddon be far off? -ed] But they’re the first to put the evidence on the record. Why? Well Dave, you wilting lily, the answer is in the url of your post: “obamas-are-first-to-document-normal-lives”. Oh, and the fact that schmucks like you keep calling them uppity arrogant elitists may have had something to do with it. The real disturbing thing is, they’re watching Seal Team Six. Nuh-uh. They’re watching Hitlers Greatest Speeches. That’s why Michelle looks kind of bored. She wants to watch her Get Whitey tape.